JudoAlberta.com is proud to feature a number of biographies of past and present members. Collette Van Orman was born on April 1, 1950 in Taber, Alberta. She was the middle child of nine, and spent her childhood on a Farm 10 miles north east of Taber. In 1961 her family moved to Calgary and then in 1964 they moved to Lethbridge. Throughout her adolescence one of Collette’s favorite places was the library. After High School Collette went to Nursing School at the Foothills Hospital and in October 1970 she met Glenn Iwaasa at a Halloween Party in Lethbridge. She graduated from Nursing School in August 1971, and started working at the Lethbridge Municipal Hospital that September. Collette and Glenn were engaged in October and they moved to Calgary where she worked at the Foothills Hospital. Collette married Glenn on January 8, 1972. Collette raised 4 children, 3 boys and 1 girl. Mark Toru Iwaasa, Steven Kojiro Iwaasa, Kevin Seiko Iwaasa and Wendy Celine Iwaasa. Collette was also raising Talani at the time of her passing. Collette became involved in Judo in January 1979 starting at the U of L at the age of 28. 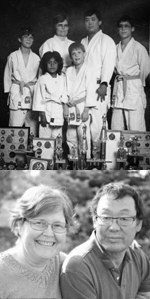 She assisted Glenn with re-starting the Raymond Judo Club in 1985, 42 years after Yoshio Katsuta opened the first Judo dojo in Alberta in 1943. After many years of dedicated work and service, she was awarded Volunteer of the Year by Judo Alberta in 2008, which was an accomplishment she was very proud of. She received her black belt in Judo on February 3, 2012 during the Raymond Judo Clubs annual parent night. In September of 2008 she was diagnosed with cancer in September of 2008 and continued to live her life with a positive and optimistic attitude. She passed away with Kevin, Wendy and close friends at her bedside on March 6, 2012. Former Judo Alberta athlete and long time judo coach and referee Wally Litousky has been nominated by Judo Alberta for the prestigious City of Edmonton Salute to Excellence Award in the category of Sport Builder. Litousky, who celebrates 56 years of volunteer service to Judo Alberta this year, was recognized at the Provincial Championships in 2003 by the Association for his contribution to Judo as a referee and all those he has coached and mentored during his first half decade in sport. Litousky was also awarded a Life Membership from Judo Alberta at that time. Six years later, Litousky’s name still brings unanimous votes from across the province. “He’s just the nicest guy”, said Dr. Yoshio Senda, CMA, who had known Litousky for the better part of the 56 years. “He was always someone you could count on to be at every tournament to referee”, Senda added. “As far as I can recall, Wally consistently attended most, if not all, tournaments in Alberta since retiring from the military in 1980”, said Guy Sunada, Judo Canada Referee Chair. “That’s why, I’m guessing that he probably holds the Alberta record for having attended more Alberta tournaments (as a referee) since Dr. Senda’s retirement from refereeing” Sunada added. Currently a 3rd degree black belt, Litousky was first introduced to Judo at the age of 15 while living in the farming community of Moose Jaw, Saskatchewan where he practiced at the local high school. In 1955 at age 17 he joined the Royal Canadian Air Force. After boot camp and trade school he was sent to RCAF Base McDonald Manitoba where he and friend Kenny Greer started a judo club, learning most of his technique from a Kodokan book. This club later expanded and moved to Portage La Prairie, Manitoba. In 1958 Litousky was posted to Germany and trained at the 4 Wing Baden-Baden judo club. In 1960 Judo Ontario’s Masao Takahashi was transferred to Baden-Baden base and between the two judo fanatics, the sport spread like wild fire. With Takahashi, Litousky visited many European judo clubs. In 1962 he was transferred back to RCAF Station Cold Lake where as a green belt he opened another club. Again, after only three months, he was re-deployed to Germany where he was stationed until 1968. During this stint in Germany he was promoted to Shodan. In between Judo and his career as a weapons technician, he also found time to marry his sweetheart Liz, whom he met in Canada but didn’t hook up with until 1964 in Germany. In ’71 the Litousky’s returned to Germany for four years where Wally took charge of the Armed Forces Europe Judo Association. Upon his return to Cold Lake he started yet another judo club on the base which he ran until his military retirement in 1980. Guy Sunada says that he and Greg Senda were on the Canadian Judo team that traveled to Germany in 1972 for a goodwill tour just prior to the Munich Olympics. “The Team flew into Canadian Forces Base Lahr…we were just a couple of young guys from back home in Alberta and Wally did his best to make us feel at home. He and his wife looked out for us and showed us around that part of Germany,” Sunada added. In 1973, Dr. Yosh Senda was traveling with the Canadian contingent to the World Judo Championships in Switzerland. “We invited Wally to come along…to be part of the Canadian group,” Senda said. Career,” Edmonton Yudanshakai President Keith McKee says. tournament every March on the Ice Palace at West Edmonton Mall. at the St. Albert Judo Club and would volunteer at various tournaments to referee. and keeping in close contact by email with judo friends in Alberta and across Canada. He and his wife Liz live in north Edmonton. Founded Alberta’s first judo club in Raymond in 1943. First President of the Alberta Black Belt Association founded in 1952. Inspirational in establishing the annual Katsuta Cup Tournament that is attended by over 300 competitors from Alberta and the United States. Elected Life member of Judo Canada in 1983. Awarded the Commemorative Medal for the 125th Anniversary of the Confederation of Canada in 1992. Awarded 6th degree black belt from Judo Canada in 1994. Yoshio Katsuta was born March 15, 1904 in Okayama, Japan. By age 15 he was involved in Judo and trained in Okayama as well as in Tokyo at the Kodokan (largest judo school in Japan) and by age 18 earned a black belt. He began instructing and also studied chiropractic because he believed a good instructor must have knowledge of chiropractic techniques to help injured athletes. In 1934, Mr. Katsuta, then a 4th degree black belt, moved to Vancouver, British Columbia, Canada and then in 1942 was re-located to Raymond where he founded Alberta’s first judo club in 1943. The Raymond Judo Club, home to around 60 young, mostly Japanese Canadians, originated at the local Buddhist church. Mr. Katsuta traveled far and wide in the Province giving Judo demonstrations and encouraging the opening of clubs in many cities and towns. Many of his students, including Yoshio Senda (now 9th degree black belt), Guy Sunada (now International A referee) and Glen Iwaasa (now Raymond Club instructor) continue to promote the sport today. Mr. Katsuta passed away on December 20, 1997 at the age of 93 years. Mr. Katsuta served as the first President of Judo Alberta upon its formation in 1952. He received the Centennial Medal in 1967. In 1987 he was awarded the prestigious Hokkaido Cup from the Governor of Japan. Judo Canada honored him in 1983 with a lifetime membership in recognition of his long and distinguished service to the sport. In 1985 Katsuta was named honorary chairman of the Canadian Senior Judo Tournament. 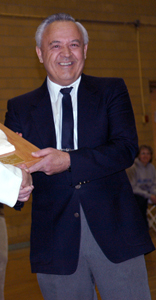 In 1987 he was inducted into the Raymond Sports Hall of Fame. In 1996 Judo Canada honoured him with an induction into the Judo Canada Hall of Fame. He achieved the Judo grade of 6th degree black belt in 1994. In 2005 Mr Katsuta received the Alberta Centennial Salute to Sport and Recreation Award, in recognition of his outstanding contributions. Mr. Katsuta’s main goal in teaching judo was to help develop the mind and body so that the individual would evolve into a good human being who would contribute to family and society. Like the precepts taught by his teachers, he wanted to maintain the essence of judo which goes beyond self defence, technical skills and sports and rather integrates the mind, spirit and body so that the person would develop as a unified being. It is about self-mastery – a way of being – that would be reflected in all aspects of one’s thoughts and behaviour in daily life. He believed that by following the path of judo for a long time, many elements in one’s personality become refined as inner clarity, alignment and harmony are achieved. “One becomes aware experientially rather than intellectually”. That feeling of direct knowingness that cannot be put in words. The focus is on conquering the “foes” within rather than external opponents. Started judo at about the age of 8 with the Lethbridge Judo Club and has practiced Judo ever since (almost 50 years). Competition was his primary focus until he went away from Lethbridge to attend university for graduate school. From that time forward Ron has spent most of his attention on teaching. After moving to Edmonton in 1971 he joined the University of Alberta Judo Club and became the sensei in 1974 and has remained the sensei of the U of A Judo Club ever since. During that time, students come through and start their own clubs, or sensei’s would drop by for the opportunity to practice with other black belts and higher ranked people. President of Judo Alberta from 1981-1987. During this time the annual budget was raised from about $30,000 per annum to nearly $200,000. The membership was raised from a few hundred to nearly 1,800 players. The efforts of the Judo Alberta Executive also saw clubs started in all of the Sport Alberta zones. The example that was set by how Judo Alberta was organized and managed was held up by Sport Alberta whenever they wanted to encourage other sports to change how they operated. Member of the Judo Alberta Grading Board since the mid 1970’s. During that time Ron has represented Judo Alberta at Judo Canada Grading meetings. He was part of the small core of people who was asked to help rewrite the Judo Canada Black Belt Grading Syllabus. ‘Regional’ referee ranking, which is the third highest international level. Ron has refereed at National Championships for many years. Ron’s greatest personal achievement is having his students become sensei’s, coaches, referees, and organizers (Judo Alberta Executive members) of Judo. The contribution that they make to the sport gives him pride as he watches the sport grow and prosper through their efforts. Mr. Tanigami is also certified as a National Level Referee, was on the Alberta Grading Committee since its inception, and also served as the Chairman for many years.